Madhya Pradesh (MP) Vidhan Sabha Election Results 2018: The Congress Wednesday emerged the single largest party in Madhya Pradesh after winning 114 seats in the 230-member House. The Congress Wednesday emerged the single largest party in Madhya Pradesh after winning 114 seats in the 230-member House. The party staked claim to form the government with support from the BSP, which won two seats. Incumbent Chief Minister Shivraj Singh Chouhan conceded defeat and resigned after the BJP was able to win only 109 seats. The Congress made significant gains in the state after a neck-and-neck fight with the incumbent BJP. Congress president Rahul Gandhi had declared victory in Madhya Pradesh on Tuesday evening, saying it was time for change and that the party would take forward the work of the previous government. Prime Minister Narendra Modi, meanwhile, congratulated the Congress for its performance in the state. The state, which voted on November 28, saw 74.61 per cent turnout — the highest Madhya Pradesh has registered in recent times. In the previous election in 2013, the BJP had won 165 seats while the Congress got 58. Highlights from the Madhya Pradesh (MP) Assembly Election Results 2018. Madhya Pradesh Governor Anandiben Patel has invited senior Congress leaders to form the government. 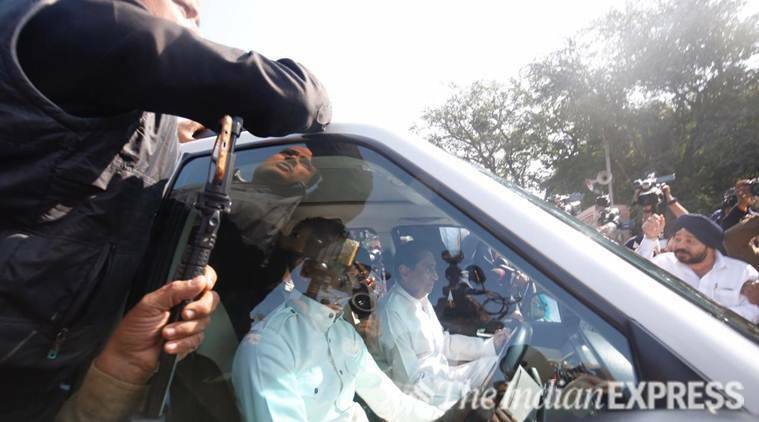 Kamal Nath, Digvijay Singh and Jyotiraditya Scindia, among others, have reached Raj Bhawan in Bhopal to meet the Governor. The BSP and the SP have lent support to the Congress to help secure majority seats in the House. The Samajwadi Party, which won one seat in Madhya Pradesh, has extended support to the Congress to help form the government in Madhya Pradesh. With two BSP seats, one SP seat and its own 114 seats, the Congress has a clear majority of 117 seats in the 230-member House. ???????? ?????? ???? ?????? ??? ????? ????? ?? ??? ???????? ?? ?????? ???? ???? Incumbent Chief Minister Shivraj Singh Chouhan has conceded defeat. "We did not get majority. We will not stake claim to form the government," he says, adding that he will tender his resignation to the Governor. The BSP has extended support to the Congress, to help it cross the halfway mark and form the government. Mayawati said the party doesn't always agree with the Congress' ideology, but will support it to help keep the BJP out of power in the state. The BSP's two seats and the Congress' 114 will help garner a majority of 116 seats in the 230-member House. The Congress is likely to stake claim to form the government shortly. The Congress has emerged as the single largest party in Madhya Pradesh after winning 114 seats in the 230-member House. The BJP has won 109 seats, while the BSP has won one seat and Independents four. Why is counting for the Madhya Pradesh elections so slow?! The Congress has won 113 seats, while the BJP has won 109. The BSP has one seat while other candidates have taken four seats. Counting for one seat is underway. Good morning! 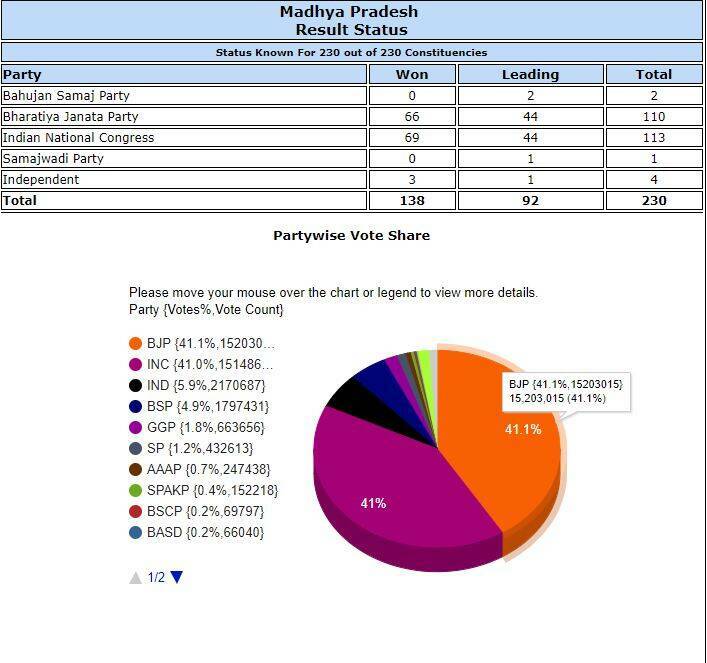 Four seats are still being counted for the Madhya Pradesh Assembly Elections. Stay tuned, we'll bring you the final numbers shortly. Right now, the Congress has won 112 seats while the BJP has won 108 seats. 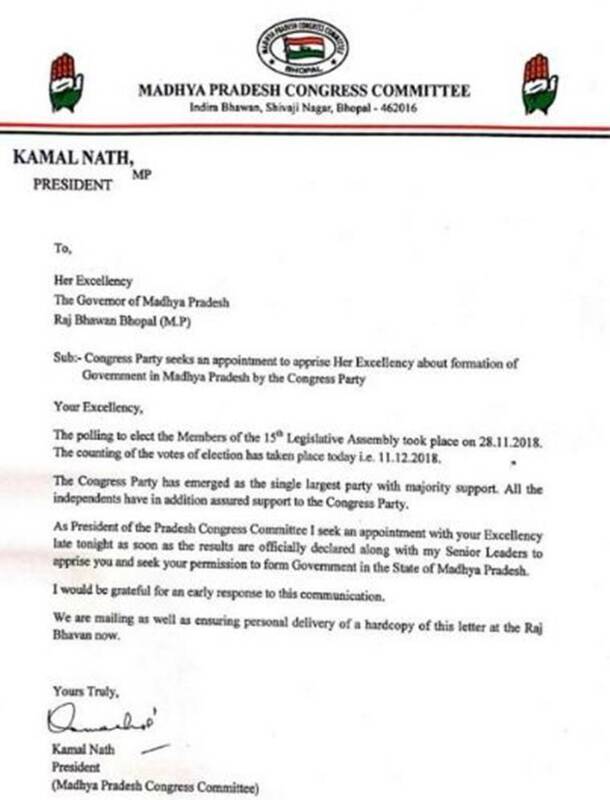 The Congress party sought an appointment with the Governor of Madhya Pradesh Anandiben Patel to apprise her about the foundation of the government in the state. 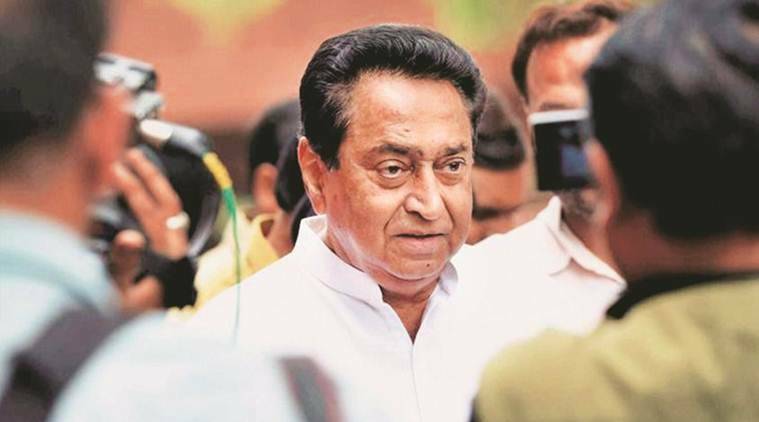 State party president Kamal Nath wrote in its letter to the Governor apprising that the party has emerged as the single largest party with majority support and sought an appointment with the Governor late tonight, soon after the results are declared. The latest trends show both the Congress and the BJP leading in 44 seats each, with the former winning 69 seats and the latter, 66. The majority mark in the 230-member house is 116. With neither party seeming to get majority, the BSP may be the kingmaker for government formation. Prime Minister Narendra Modi congratulated the Congress Tuesday on the results of Assembly elections in three states- Chhattisgarh, Madhya Pradesh and Rajasthan-where the opposition party is leading over the BJP. The Prime Minister says the BJP "accepts the people’s mandate with humility", thanking the people of the three North Indian states that had been the party's bastion. Congratulations to the Congress for their victories. Congratulations to KCR Garu for the thumping win in Telangana and to the Mizo National Front (MNF) for their impressive victory in Mizoram. 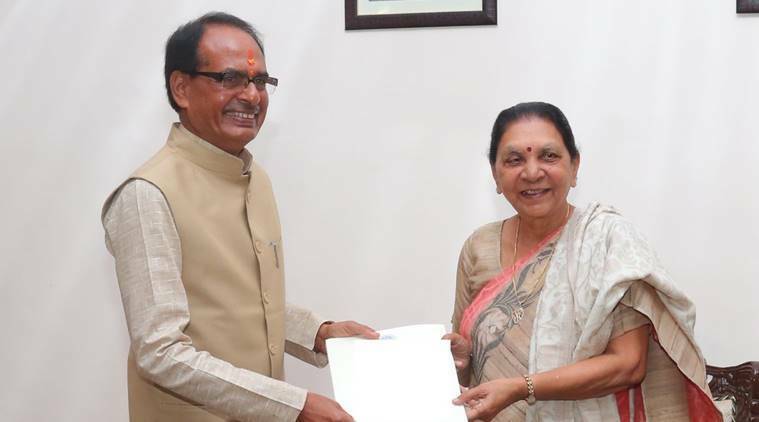 Chief Minister Shivraj Singh Chauhan has won from the Budhni constituency, with 123492 votes, ahead of Congress' Arun Subhashchandra. The BJP, however, is leading in 109 seats in the state, behind the Congress, which is leading in 114 seats. BJP's Yashodhara Raje Scindia wins from Shivpuri constituency with a margin of 28,748 votes. K Chandrashekhar Rao’s Telangana Rashtra Samithi (TRS) has swept the state. For the BJP, more than losing the election, the fact that these numbers put its dream to enter southern India on hold should be of greater concern. Congress chief Rahul Gandhi, addressing reporters, said the results of the state assembly elections is a "victory for Congress workers, small traders, farmers", adding that it is a "big responsibility" for the party. Hinting at a post-poll alliance, Gandhi said "the ideology of SP, BSP and Congress is the same - different from that of BJP." In Madhya Pradesh, the SP and BSP are leading on 1 and 2 seats respectively, while the Congress is leading on 111 seats, 5 seats short of the majority mark. The Congress has won 14 seats in Madhya Pradesh and leading in 97, giving a tough fight to the BJP, which is leading in 94 seats and has won 16. The Congress party, leading in three BJP ruled states- Chhattisgarh, Rajasthan and Madhya Pradesh- said the results show that "democracy has won". "Democracy has won. Thank you India, you have chosen love over hate, peace over violence and truth over lies," the party tweeted. Congress candidate PC Sharma is leading in the Bhopal (South West) constituency with 6 votes, ahead of BJP's Umashankar Gupta, according to the latest EC trends. The Madhya Pradesh elections results could be anyone's guess right now, with both the Congress and the BJP in a nail-biting contest to win majority in the state. The BJP has won 3 seats and is leading on 104, while the Congress is leading on 114 seats. BJP's Aakash Kailash Vijayvargiya has won from Indore-3 constituency with a margin of 7000 votes. The halfway mark being 116, the BSP may emerge as kingmaker in goverment formation. Mayawati's party is leading on 2 seats. As trends indicated Congress' good show in Madhya Pradesh with the party having a close fight with the BJP, the opposition party said the "money power" of the BJP stood defeated by the "people's power". A dozen ministers in the Shivraj Singh Chouhan-led BJP government in Madhya Pradesh were trailing in the state Assembly polls as per the latest trends, PTI reported quoting an election official. Minister Narottam Mishra was trailing in Datia while Rustam Singh was at the third position in Morena constituency. Balkrishna Patidar was trailing in Khargone, while Lal Singh Arya was lagging behind in Gohad seat in Bhind district. Barwani district. Deepak Joshi was behind in Hatpipliya seat in Dewas district, while Rampal Singh was trailing in Silvani seat in Raisen district. Minister Archana Chitnis was also trailing in Burhanpur seat. State finance minister Jayant Mallaiya was behind by 1,336 votes in Damoh seat. Another minister, Sharad Jain, was trailing in Jabalpur North seat and Jaibhan Singh Pawaiya in Gwalior seat. Former prime minister late Atal Bihari Vajpayee's nephew and Morena BJP MP Anoop Mishra, who contested the election on the BJP's ticket, was trailing from Bhitarwar seat in Gwalior district. BJP Rajya Sabha MP Sanjay Kakade said the party is surprised with the trends showing a neck-and-neck fight with the Congress in Madhya Pradesh, where the incumbent party was expecting a sure victory. "I knew we would lose in Rajasthan and Chhattisgarh but MP trends have come as a surprise. I think we forgot the issue of development that Modi took up in 2014. Ram Mandir, statues and name changing became the focus," he told news agency ANI. The BJP has secured 1 seat and is leading in 106 others in the 230-member house in Madhya Pradesh, as Congress leads in 113. The BSP could be a kingmaker, leading in 4 seats. The BJP headquarters in Delhi was witness to a gloomy atmosphere, as fight to retain its heartland states-Madhya Pradesh, Chhattisgarh and Rajasthan grow seemingly elusive, with tough fightback from the Congress. The Congress is leading in 113 seats in Madhya Pradesh, with the BJP behind in 106, according to latest trends by the Election Commission. 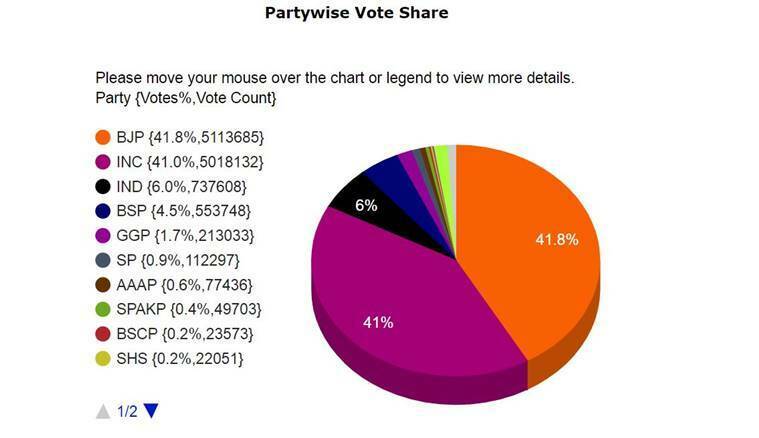 The vote share, however, is 41.3% with the BJP and 41.2% with the Congress. With the Congress throwing a tough fight to the incumbent BJP in Madhya Pradesh, Jyotiraditya Scindia, who spearheaded the party's campaign in the state, exuded confidence in its victory, but remained elusive on who the party will choose to be the Chief Minister in case it wins. Asked about posters being put up that Kamal Nath would be CM, Scindia said, "Let us not put the cart before the horse. Let us wait for the verdict". The closely-contested Madhya Pradesh elections are throwing a neck-and-neck fight between the Congress and the BJP. With the final numbers yet to come in, the BSP, leading in 4 seats, may be the kingmaker in government formation. The Congress party, however, has jumped leaps this time around, from just 58 seats in 2013. 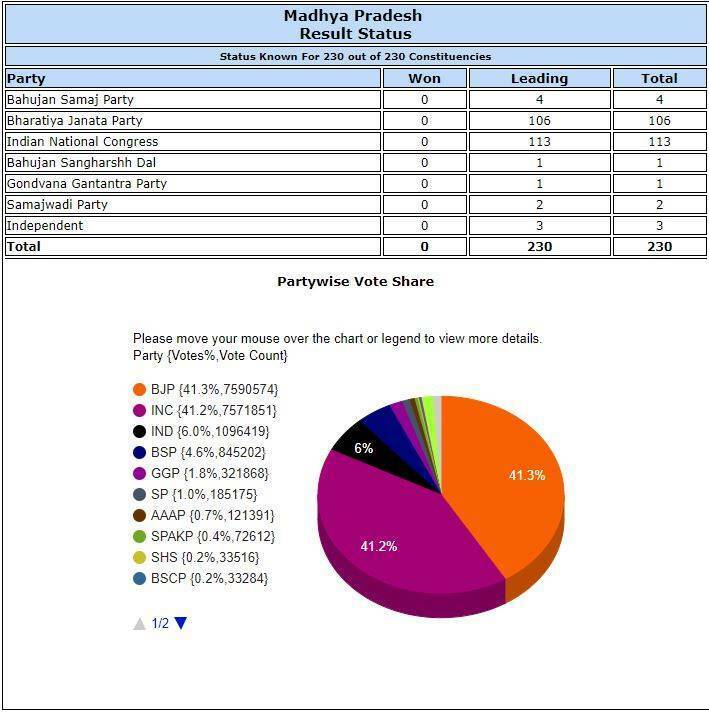 In the previously held elections in Madhya Pradesh, the BJP won a comfortable majority with 165 seats in the 230-member house. BJP's lone Muslim candidate Fatima Rasool Siddiqui is trailing from Bhopal (North). Congress' Arif Aqueel, who has represented the constituency since 1998, leads by a margin on around 23,000 votes. In Tikamgarh seat, meanwhile, Congress' candidate Yadvendra Singh leads with 17,000 votes over BJP's Rakesh Giri. None of the Above (NOTA) has a higher vote share — 1.5% — than the Samajwadi Party (1.0%) and AAP (0.6%) right now. In other trends, the BJP is currently leading in 111 seats while the Congress is up in 109 seats. The BSP leads in three seats, while other candidates in seven. Here are some trends emerging from Madhya Pradesh. Women and Child Development Minister Archana Chitnis is trailing in Burhanpur by 4,000 votes, while Agriculture Minister Gaurishankar Chaturbhuj Bisen is ahead in Balaghat. Revenue Minister Umashankar Gupta is leading in Bhopal South West by a small margin. CM Chouhan continues to lead from Budhni seat. Up to 15 rounds of counting has been completed in Madhya Pradesh. Here are some trends: Shivraj Singh Chouhan leads from Budhni by over 33,000 votes, Congress candidate Arun Subhashchandra trails with nearly 14,000 votes. In Shivpuri, Yashodhara Raje Scindia leads by 33,000 votes, while Congress' Siddharth Ladha has 17,000 votes. Congress chief Rahul Gandhi arrives at 10 Janpath, the residence of UPA chairperson Sonia Gandhi. Trends show the party is ahead in Rajasthan and Chhattisgarh, while Madhya Pradesh witnesses a neck-and-neck fight between the ruling party BJP and Congress. National Conference leader and former J&K chief minister Omar Abdullah calls it "even-steven" in Madhya Pradesh. "From what I hear the BJP hasn’t given up the hope of forming a government there. 'Others' in Madhya Pradesh will be a happy lot at the moment." Here's what the vote share looks like right now. The BJP is marginally ahead of the Congress. The party has a 41.8% vote share compared to Congress' 41%. The smaller parties have a 17% vote share. Buoyed by the Congress' good showing in the polls that was dubbed as a semi-final for the 2019 general elections, party president Rahul Gandhi said the outcome is a "clear message" to the Modi government that people are not happy with it and time has come for a change. The BJP was battling anti-incumbency in Madhya Pradesh, after governing the state for 15 years. Following the exit polls, the party has been in touch with potential winners among independent candidates as well as the Bahujan Samaj Party (BSP). A senior leader had told The Indian Express, "MP does not have a history of a fractured mandate but the exit polls have induced a sense of anxiety in the party. We are doing everything that it takes to be in the race." The BJP had expelled more than 50 party functionaries who defied the party line by filing their nomination as Independents. The Congress was eager to wrest power from the saffron party and gain ground in the Hindi heartland. The party's narrative in Madhya Pradesh was largely state-centric, down to constituency-level issues in most places. While Prime Minister Narendra Modi criticised the party for bringing in gaushala and gau mutra in its manifesto, saying "it worships the cow in Madhya Pradesh but allows its leaders to eat beef in Kerala", Congress president Rahul Gandhi raised issues from demonetisation to the Rafale deal in his speeches in Madhya Pradesh. He targeted the Prime Minister for “betraying” the people and used the slogan “chowkidar chor hai (the watchman is a thief)” repeatedly to attack him.